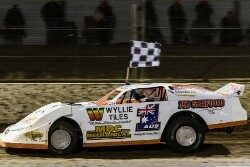 Callum Harper has sent an ominous warning to the opposition in the up-coming National Super Sedan Title, when the Tasmanian based driver won the Victorian Title on Saturday night, at the home of the National Title, the Heartland Raceway, Moama. Harper lead all but the opening lap of the thirty five lap A Main, after starting on the front row with Ryan Alexander. Dave Gartner made some early moves after starting from position six, but despite the best efforts of the defending Champion, he could not pass Harper at any stage. Ash Bergmeier, who started on the second row dropped to fourth in the early exchanges, but moved to third on lap fifteen at the expense of Alexander, and then to second on lap twenty, demoting Gartner back to third. Alexander would recover back to third as the trio had a tremendous race for the minor placings. Gartner in the latter stages would slowly go back through the field, with a broken shock. Newly crowned Tasmanian Champion, Adam Beechey moved to fourth in the concluding stages, having a great battle with Alexander. Bergmeier was within five car lengths in the latter stages of the race, but the two time National Champion proved too good, becoming the first Tasmanian to ever win the Victorian Title. Bergmeier would finish second for the second time in his career, while Alexander would just hold off Beechey by 0.095 of a second for third. Jamie Collins and Mick Nicola Snr finished further back in fifth and sixth respectively.